As much of North America gets bombarded by prolonged snowstorms and subzero temperatures, Paradise Island remains an ultra-relaxing tropical Bahamas escape. We’ve been experiencing nothing but sunny skies and mid-70s here at Paradise Island Beach Club, one of the premier Bahamas beach resorts. Most families and couples choose our breathtakingly serene island to jet ski, snorkel, and sunbathe, but the golf here on Paradise Island is arguably the most underrated aspect of our beach paradise. Luckily for you, one of the best Paradise Island golf courses is a short stroll from our luxurious Bahamas villas: Ocean Club Golf Course. After waking to a genuinely breathtaking Caribbean sunrise with a steaming cup of locally-roasted coffee, take a scenic bike ride to nearby Ocean Club Golf Course. Due to our island’s size, there aren’t many Paradise Island golf courses to choose from, but it simply doesn’t get any better than Ocean Club. We offer discounts on this beautiful championship course, which was designed by Tom Weiskopf. Weiskopf’s work includes the renovation of San Diego’s Torrey Pines and the design of Scotland’s Loch Lomond. 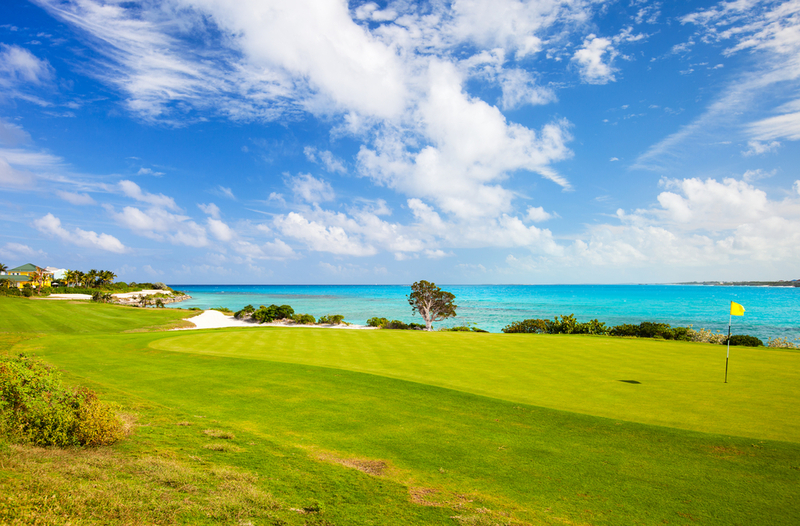 This challenging yet gorgeous par-72 course stretches over 7,100 yards along the east side of Paradise Island. Many holes start or end near the sandy beach. Ask about our Bahamas golf getaway discounts by dialing 1-800-310-5148. We always recommend combining 18 holes at the Ocean Club Golf Course, one of the premier Paradise Island golf courses, with soothing on-site spa treatments. Paradise Island Beach Club proudly employs a group of experienced, talented masseuses, yoga instructors, and reflexologists. We provide twice-weekly yoga classes, massages by the beach, exfoliating foot massages (a guest favorite), and so much more! Our goal is to help relieve muscle aches, reduce stress, and eliminated toxins. If you have any questions about our extensive services, please ask our knowledgeable concierge upon arrival. Paradise Island Beach Club is so much more than just a resort – we provide guests with a supreme level of serenity that they didn’t realize existed. Play 18 holes of oceanfront golf, receive world-class spa treatments, take a dip in our sun-kissed heated pools, and snorkel through the warm, teal gulf water. We provide everything from Junkanoo festivals to chartered excursions to beautiful Rose Island. Give us a call today at 1-800-310-5148 to book a well-deserved, once-in-a-lifetime family vacation to the Bahamas!